Check out the past Crazy Captions photos for a good laugh! April 2001 ��"Redneck Tree Stand"
June 2001 ��"Take Me To Your Leader"
July 2001 ��"Why Dads Shouldn't Give The Baby A Bath!" August 2001 ��"Kiss Me You Fool!" September 2001 ��"Redneck Deer Camp"
October 2001 ��"Can You Come Out To Play?" December 2001���"The Tall Tale Club"
January 2002 ��"A Deer Hunting"
February 2002 ��"Just What I Need!" March 2002 ��"What Are You Looking At?" June 2002 ��"Hey Buddy! Got A Light?" July 2002���"Did You Hear Something?" August 2002���"Takes Two to Tango"
September 2002 ��"Stand Back Or I'll Jump"
October 2002 ��"I See Dead People"
November 2002 ��"The Mighty Hunter"
January 2003 ��"I Hope The Wind Doesn't Start Blowing!" February 2003 ��"Do You Have Reservations?" March 2003 ��"Which Way To Daytona?" April 2003� ��"A Face Only A Mother Can Love"
May 2003 ���"I Told You It's Mine!!!" June & July 2003 ���"Are You Guys Sure This Is The Way?" August 2003 ���"Ta� Da..! And For My Next Trick..."
September 2003 ���"Did I Do Something Wrong?" October 2003 ���"Why Did You Wake Me Up?" November 2003 ���"Take Us To Your Leader"
December 2003 ��"Help! He's Got Me!" January 2004 ��"Catfish And Beer, My Favorite Meal!" February 2004 ��"Do Not Disturb." April 2004 ��"Quick, Take The Picture!" May 2004 ���"See What I Got For My Birthday!" June 2004 ���"I'm Soooooo Bored"
July 2004 ���"Just A Little Further!" August 2004 ���"I Hope This New Camo Is Working"
September 2004 ���"Can't Believe I Made It Out"
October 2004 ���"Look Out! Here I Come!" November 2004 ��"What Do You Want?" December 2004 ��"Don't Mess With Me!" January 2005 ��"It's A Living"
February 2005 ��"Come On! Pick Up The Pace. Jeez!" March 2005 ��"Where Am I?" April 2005 ��"What? I'm Watching The Parade!" May 2005 ��"Taking 'Fly-Fishing' To New Heights"
June 2005 ��"Hurry Up! I Can't Hold This Note Forever!" July 2005� "Don't Feed The Animals"
August 2005 �"Where's Rocky The Squirrel When You Need Him?" October 2005 "What Is That Smell?!" December 2005 "Is That A Smile Or Is It Gas?" January 2006 ��"I Think I'm In Love." February 2006 ��"Hold This Will Ya?" March 2006 ��"Please, No More!" April 2006 ��"Surfs Up Dude!" May 2006 ��"What? Me Help Him?" June 2006 ��"Want To Go Back To My Place?" July 2006�� "I'm So Having A Good Time." August 2006 ��"I Got 'em! I Got 'em!" September 2006 ��"Attack Of The Zombies!" October 2006 ��"I Caught 'Em All By Myself." November 2006 ��"Yup. There's A Cavity On That Molar." December 2006 ��"Super Fan To The Rescue." January 2007 ��"This Should Answer The Age Old Question." March 2007 ��"C'mon, Make With The Hand-out!" April 2007 ��"So That's What They Look Like." May 2007 ��"I Told You I Couldn't Swim!" June 2007 ��"Hold This Will Ya"
July 2007 ��"Do Not Disturb!" August 2007 ��"Say Hello To My Little Friend!" September 2007 ��"Looking For Trouble"
October 2007 ��"Alright! Sunflower Seeds!" December 2007 "This Is The Best Gift Ever!" February 2008 "What's So Funny About This?" March 2008 "Shorty The Clown"
April 2008 "I Hate These Games Of Freeze Tag." May 2008 "What Da You Want To Do Now Spike?" June 2008 "Bert and Ernie Go Fishing"
July 2008 "Give It To Mikey. He'll Eat Anything"
August 2008 "Who Wants Pie?" September 2008 "Doesn't Ben Own A Boat?" October 2008 "I Know My Ball Landed Around Here Somewhere." November 2008 "I Wuv You, Yes I Do"
December 2008 "Be Very, Very Quiet. I'm Hunting Rabbits." January 2009 ��"I Don't Feel So Good." February 2009 "Don't Get Nosey Bub!" March 2009 "Which Way Did He Go?" April 2009 "Duffy's Catch Of The Day"
May 2009 "I'm Going To Mess Up Someone's Day!" June 2009 "Whatcha' Doin' Up There?" July/August 2009 "Wow! That's Sour!" October 2009 "You Knocked My Block Off!" November 2009 "Where Do You Want Him?" December 2009 "What's That Over There?" January 2010 ��"I Hate Playing Freeze Tag." We need your pictures for our newest feature, Candid CamShots! 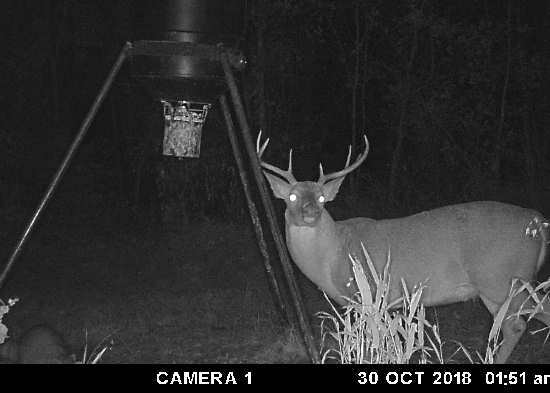 Trail cameras have grown popular in recent years and here's your chance to share some of your best shots. Click Here to Enlarge! �We are proud to present the Rustic Originals Photo Collection. Every couple of weeks we'll highlight a new photo for your enjoyment. Click Here to view the featured photo. Subscribe to the Backwoods Bound "Bullet" ! Lost in the woods? Subscribe to our monthly newsletter "The Bullet". Please make sure your address is correct before submitting. Click Here To Read The Current Newsletter.